The Fire Museum is a kids favourite! Lots of displays that include fire engines and helicopters that make for a few fun hours! 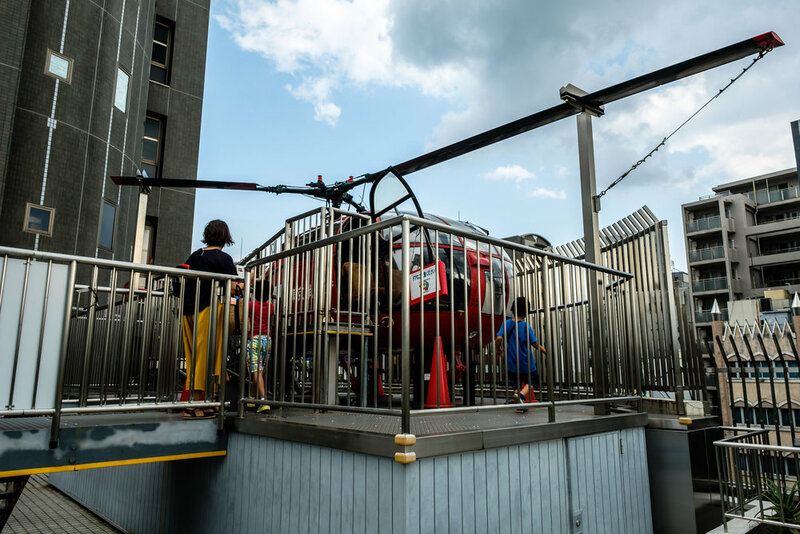 Tokyo's Fire Museum is all about the story of firefighting in the city. It offers a visual history from the past to the present. Admission is free and it is one museum that children will love. And to be honest, I think even most adults will enjoy it as much as the kids. One of the good things about the museum is the location. It is right next to a subway station, Yotsuya-sanchome, which is on the Marunouchi line. Find your way to Exit 2 and you are there. You don’t even need to go outside as they are practically connected. Enter the basement area, pick up your visitor’s badge and you can move over to the big exhibits, the fire engines, only a few meters away. The engines, from the United States, France and Germany, date back to the 1920s, while some of them are more modern. Any wannabe or future firefighter will be sure to love them. While you’re there you can pick up an English-language headset that will tell you more of the exhibits. One thing you might need to be aware of is that the building is also occupied by the real fire department so there are a few floors you won’t be able to enter! There are a couple of floors used as conference/event rooms and libraries, but most visitors will have no need to visit them. So, that leaves the first, third, fourth, fifth and tenth floors. The first floor holds one big exhibit, a big one, a real helicopter that was used in Tokyo for rescues until the early 1980s. It is very cool and another that I’m sure will excite kids of all ages. The third floor is all about firefighting in the modern age. Kids will love it because as well as the static displays of modern equipment and gear that looks cool and exciting. They can also climb into a truck and helicopter while wearing the fireman’s outfits that are provided for free. History is what the fourth and fifth floors are about. I think they are great, some excellent static displays. The fourth floor focuses on the Meiji, Taisho and early Showa periods when Japan was importing and creating its own firefighting technologies. It also has some historically interesting pictures of the Great Kanto Earthquake in 1923 and the Shirokiya department store fire in 1932. Exhibits on the fifth floor include lots of firefighting equipment, uniforms and scale models of fire-fighting during Japan’s feudal area. What I liked the most though, were the matoi. Edo (as Tokyo was once known) was filled with wooden buildings and prone to fire. To combat the fires there were many different firefighting units, but they weren’t unified. As each group was independent, they needed their own unit symbol or standard, which were the matoi. Made of wood, they were of unique design and weighed about twenty kilograms. At fires, a designated fireman would wave it overhead to signify which group/s were in attendance. The fifth floor even has its own helicopter, outside on the roof. The French-built machine was in service from the 1960s until the 1980s. It is very popular with kids, but will be closed in the event of high winds. Lastly, there is the tenth floor where you will find tables to enjoy your lunch, if you’ve bought any! There is no food on sale there but there are some drink machines. It has quite large windows, just a pity they don’t offer a 360°view, but you can see Tokyo Skytree, Shinjuku and on a fine day, Mount Fuji. That is pretty much it. If you are after something that will entertain yourself as well kids, the Fire Museum is pretty good, especially considering that it is free and very easy to get to. You can see its (Japanese) website here. It is so easy. Just use the Marunouchi subway line to get to Yotsuya-sanchome station. Leave via exit 2 and that will put you at the basement level entrance of the museum. You don’t need a map to get there, but here is one anyway! The Fire Museum is open Tuesday to Sunday, 9:30 am to 5 pm. It is closed on Monday (unless it is a national holiday, then it will be closed the following day) and over the New Year period (December 28th to January 4th).